It’s been a very busy year here at Makin’ Moves HQ! We’ve worked with some incredible artists and producers.. We’ve been hot on the heals of UK producer Curtis Kirkland who’s done some great work with labels such as Papa and Reel People Music and Room Control. This release sees Curtis’s production skills partnered with amazing UK soul singer Selina Campbell who displays her full array of vocal talents on this fab record. On keys is the amazing Keidi Tatham,bass Ernie McKone and on Congas and Timbales Carl Smith. The release also features an instrumental and crafty dub mix too boot! As many of you know one of our keen music heads Claire Tomlinson, passed away after a short battle with cancer in September aged only 35. Growing up at her parents farm in Southport she was a regular at the Southport Weekender, and also at suncebeat in Croatia. Over the years she made many friends along the way, from different parts of the UK and Europe and many of you were kind enough to donate money to her You Caring page during her fight. She fought a gallant battle, and she was heavily support by people from the music scene during this time, even now 3 months on and her Facebook page is busy with people posting lovely photos of Claire. It was a massive blow to our community because she was such a lovely person both inside and out, and this was not long after losing another soul solider in Owen Money that also rocked our community. Claire loved to dance and anyone that meet her was instantly taken to her. Claire’s funeral took place in late September in her home town of Southport and only a small group of her London friends managed to make it so for the past three months her London family have been working on getting Claire a special memorial bench inside the grounds of St Pauls Cathedral where Claire and her mum used to sit during her treatment at Barts. The cost of bench is over £1000 so we intend to use the money from donations to pay for the bench and plaque. 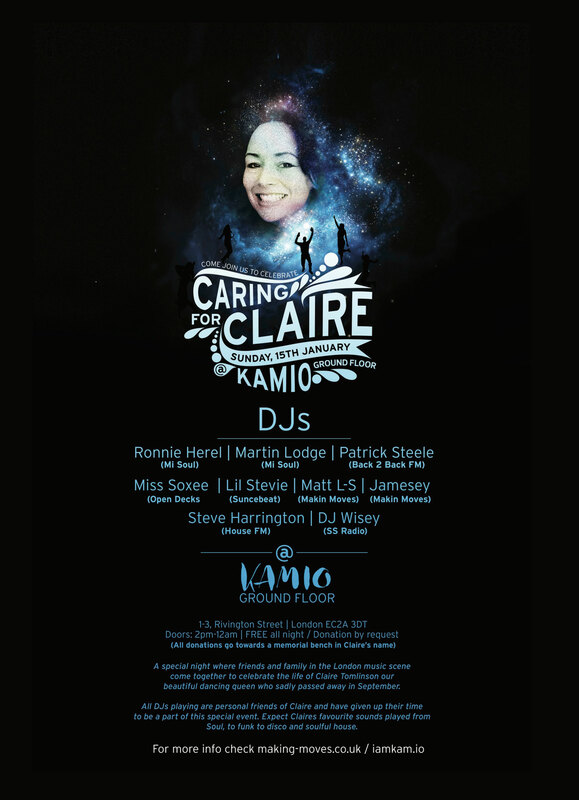 All DJ’s playing at this event are personal friends of Claire and have given up their time to be part of this special event. On Sunday 11th December come and check out our residents Matt L-S and Jamesey at the Club Moxa opening party at the impressive Miranda club situated inside the Ace Hotel in Shoreditch. It will be the last dance before the new year so we hope to see you all in the house inside this amazing new venue!! Club Moxa is run by our good friend Simone who used to have his own club in Mantova, Italy and he’s now bringing that special vibe to London and it’s fantastic to be a part of it. It will be an extraordinary night of great music and art.